It’s the end of November and to see us into the month full of festivities, Romford have put on an action packed open card. Featuring the semi finals of the Essex Vase it’s a card not to miss and regular readers will know all about three of the greyhounds still in the competition. Tonight’s focus though is away from that and covers greyhounds making their Romford and six bend debuts. Local handler Phil Simmonds is the man in form when landing the Romford puppy cup last week with Grays Cup Winner going unbeaten through the category one competition. Regular readers will know he suggested he was the best chance of his runners last week and he wasn’t wrong when claiming the spoils at a starting price of 2/1. Tonight Simmonds runs two dogs for the first time on these shores and one is making her six bend debut. As usual I’ve found out more about all three. First up is Walk On Thomas in a maidens race at 6.44pm over 400 metres. The October ’16 whelp is making his race debut on these shores after three trials all over C&D. He has winning form at Dundalk over 366 metres so does have race experience. He is going the right way in trials with his last split time of 3.78 encouraging. Trainer Simmonds on him said: “He is a lovely dog and have put him straight into a maiden. He would have probably gone into an A1 race so thought we would enter him in a maiden. It is worth the try. “Trap five should be okay but will know more about him after the race on Friday. Ladbrokes are top price 7/2 for Walk On Thomas to win on his debut. In the following race at 7.03pm Hitachi Hoban is also making his Romford race debt in a maidens race over 400 metres for trainer Simmonds. Like kennel mate Walk On Thomas, the December ’16 whelp is making his race debut on these shores but is no novice. 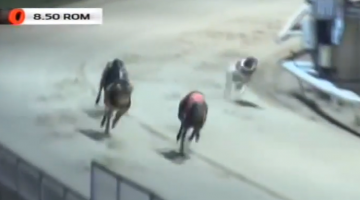 The son of Sidarian Blaze and Hitachi Mollie has won at Shelbourne Park over 480 metres so does have race experience. He has had two recent trials over C&D and improved both his split and trial times in his second trial. He is clearly going in the right direction and would be expected to continue to improve. Trainer Simmonds on Hitachi Hoban said: “He has a card at Shelbourne Park and is more of a 480 metres dog than 400 metres. He has to start somewhere so we decided to give him a maiden race over 400 metres. Trap three is fine for him to start with and will see how he gets on and where he wants to be. Ladbrokes like for his kennel mate are top price 15/8 for Hitachi Hoban to take the spoils. Unlike her kennel mates, Cozzys Fozzy has run at Romford several times. The difference for the September ’16 whelp is that she is making her six bend debut in a maiden stayers race at 9.08pm over 575 metres. The daughter of Aero Majestic and Aero Babooshka has run all her twenty six races at Romford in graded races over 400 metres winning five. She has just won an A3 race so goes into tonight in good form. Trainer Simmonds on Cozzys Fozzy said: “She is a strong runner but we just don’t know if she gets it. We are keen to see how she gets on. She could win a 480 metres maiden. She will get 510 metres but not sure about the extra sixty five metres. Several firms are 10/1 for Cozzys Fozzy to overcome a very tough draw. Ridgedale Max runs in the first semi final of the Essex Vase at 8.21pm and is best price 4/5 with William Hills. Newly appointed Romford trainer Jean Liles is taking a team down to Romford tonight. Moving from Central Park she is warming up with five open racers tonight. The focus of tonight’s column is on Knockdrinna Kidd in a winner of one standard race over 400 metres at 7.17pm. The February ’16 whelp is making his Romford debut tonight and will be looking to win first time up. His sole open win came at Central Park over 480 metres at the first and only open attempt. The son of Lennon Bolt and Knockdrinna Miss is in good form winning an A1 graded race at Central Park recently and back in September won a D1 sprint race over 265 metres. Assistant trainer and partner to Jean, Colin Creighton on Knockdrinna Kid said: “He’s a dog that is a non stayer with 480 metres his top distance. He is a late developer and is coming on a ton. I’m not sure if he has the early against natural 400 metres dogs but we will see. Ladbrokes make Knockdrinna Kid a 14/1 shot. Droopys Baz runs in the 9.08pm over 575 metres and is available at around 9/2 to take advantage of being the sole wide seed in the race. Regular readers of this column may of had a nice 7/1 winner last week curtesy of Prime Time who won his first round heat of the Essex Vase. Those who followed Phi Simmonds advice of backing Grays Cup Winner may also of had a nice little 2/1 winner when landing the puppy cup final.